I didn’t mean to do two noodle bars in a row. 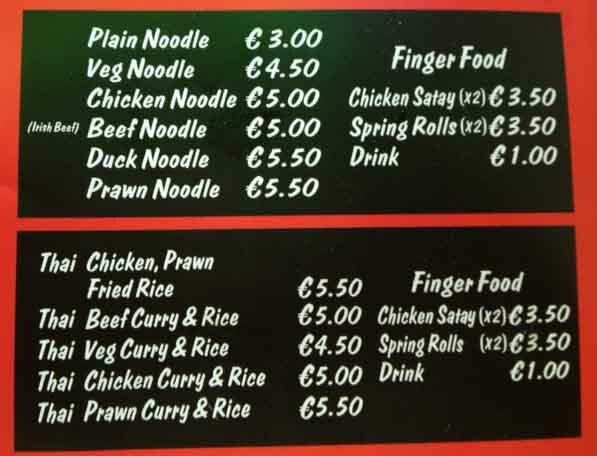 I had intended to try out Kylemore Cafe on O’Connell Street to see what might be on offer for fiver. I could have had a 4 piece all-day breakfast but, to be honest, I didn’t fancy it so I thought I’d have a look around and see what I could find. North Earl Street is dominated by Boyers, home to the polyester cardigan. Infrequently, I go into Boyers just to remind myself what department stores used to look like in the 1970s. Today several staff members seemed to be stuck in what I can only describe as an intimidating pose: arms folded, frowning, grimly set lips. As ever, the dominant colours of the shop are grey and brown and the displays are as lacklustre as they’ve always been. I did a swift wheel and left. I found the Hot Wok by accident. It’s just at the junction of North Earl Street and O’Connell Street, opposite the Kylemore Cafe. It’s small, with a cooking area behind a serving area in which all the menu items are on display. There are counters on either side of the door with 6 stools. Another 4 people can sit outside, at two tables. I got there just before 1pm and I was lucky to get a seat. The place was incredibly busy just after 1. Behind the counter was one guy cooking and two very smiley, welcoming and quick servers, serving. 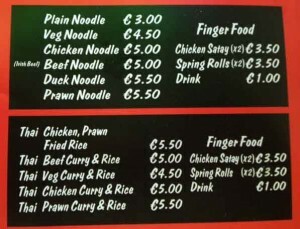 The menu is dominated by noodle and rice dishes with everything except the duck and prawn options costing a fiver or less. 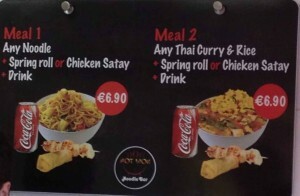 They also do some combination meals for €6.90 comprising a rice or noodle dish, satay sticks or spring rolls and a can. I opted for the Thai Chicken Curry and rice. 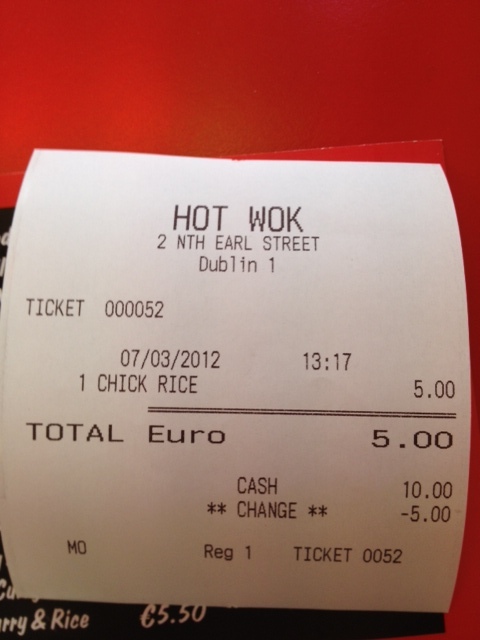 As I’ve come to expect now, it was spooned out into one of those nice take-away boxes. 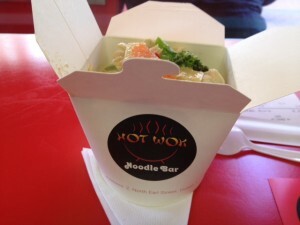 The portion was very generous and steamy hot too. I grabbed a set of disposable chopsticks, found my seat and tucked in. 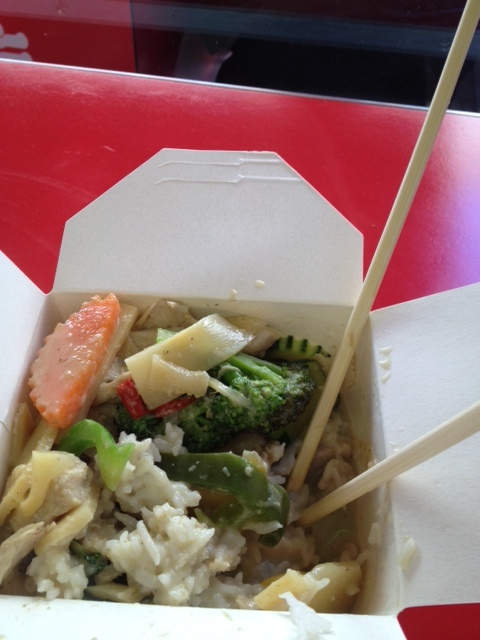 The curry comprised a decent amount of chicken, with bamboo shoots, green pepper, courgette, carrot and broccoli. The sauce wasn’t anything special and I imagine that it originated in a jar. It was a generic Thai green curry: coconut-y and quite sweet with a mild spicy heat. Tasty. This was one of the busiest eatforafiver spots I’ve been in. It’s a prime location (unlike that poor man I wrote about recently stuck up near Christ Church Cathedral), with lots of passing trade: shoppers and office workers. 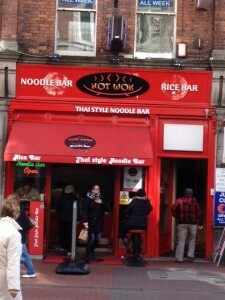 I got the impression that there were quite a few regulars but there were some who were evidently new to the noodle/rice box idea. The staff were helpful at explaining what was on offer. Most were takeaway customers. Food eaten, I wandered around a bit. There’s a Polish foodstore near the junction with Marlborough Street that has a restaurant upstairs, offering different sized plates of food, with the smallest plate costing €4, so that’s gone on my list. In fact, it’s about time I explored some Euro-food. 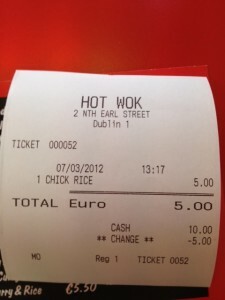 I seem to remember a place on Moore Street offering Balkan pies for a fiver.